(March 12, 2018) It turns out that Credit Karma, an online company that made its fortune by handing out personal financial advice and tax assistance to 75 million people, might want to start looking around for some good advice and assistance for itself. The Securities and Exchange Commission disclosed Monday that the privately held startup has agreed to pay a $160,000 fine for violating regulations — apparently willfully and knowingly — concerning the issuance of stock options by withholding key information from employees. Although the company, launched in 2007, began issuing stock options in 2011, at issue was the $13.8 million in options that Credit Karma issued to its workers between October 2014 and September 2015, the SEC said in its settlement order. At that level, a registration of shares becomes mandatory. It’s not really the slap on the pocketbook that hurts. Instead, it should be the disclosed attitude of how the company regards regulatory requirements, as well as the people who work there. Instead, employees were exercising their options and bought stock in the offering “even though they were not given the required disclosure information.” And that, it seems, violates the Securities Act. In fact, the SEC said, as early as April 2015, some Credit Karma executives were aware of the requirement. By August of that year, the company’s senior executives were not only aware of it, but a reference to the SEC rule was included in a presentation to the board of directors, the SEC said. 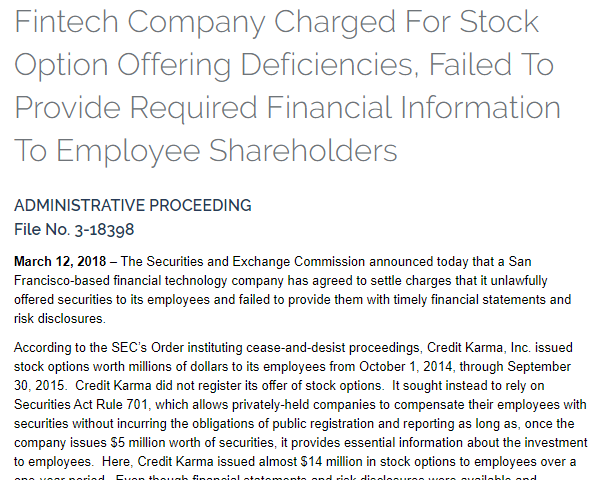 As a result, employees at the San Francisco-based company exercised nearly 200,000 options and paid $550,535 “without receiving Credit Karma’s risks disclosures or detailed financial information,” the SEC said. And this was despite the fact that the information existed and had been made available to institutional investors. “Credit Karma did not, however, provide the same information to its own employees because it viewed the Company’s financial information as highly confidential and proprietary,” the SEC concluded. Credit Karma has 15 days to pay the fine, and, among other things, it must promise not to do this again.